Adam Peaty believes a three-month doping ban for Olympic champion Sun Yang was too short. Chinese swimmer Yang, who won 400m and titles at London 2012, tested positive for banned stimulant trimetazidine in May. "I do find it disturbing that it was such a short ban," England's Peaty told BBC Sport. Peaty joined Olympic silver medallist Michael Jamieson in stating that the punishment was not consistent with those handed out for missed tests. All elite British athletes registered to compete are required to declare their whereabouts with UK Anti-doping every day of the year so they can be reached for out-of-competition testing. If an athlete misses a test three-times within 18 months they are banned for between 12 and 24 months. "You get more of a ban for admin failure than you do for actually taking the drugs, which defeats the object really," 50m breaststroke world record holder Peaty said. 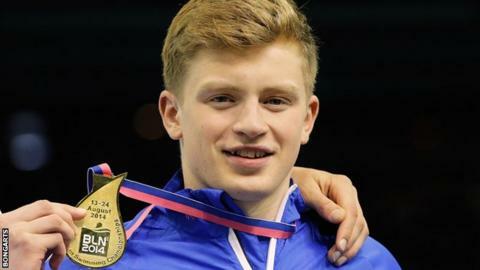 Commonwealth and European breaststroke champion Peaty also says it is "outrageous" it took six months from the initial test for the news to be made public. Yang says he was prescribed the drug for a medical condition by his doctor Ba Zhen - who has been banned for one year. China's Anti-Doping Agency (Chinada) says it believes the swimmer was "not completely responsible" for the failed test and that the three month ban was appropriate. The length of the ban enabled Yang to return for the Asian Games in South Korea in September - where he claimed three gold medals. He will also be eligible for the World Short Course Championships in Doha, which begin next week, although the Chinese team are yet to reveal their full line-up.